The Walt Disney Studios Twitter page has released an The Incredibles 2 motion poster offering "A Toast to the New Year." With a piece of Baby Jack Jack seared toast. Get it? This literal toast comes roughly a month after Disney released the teaser trailer for the most anticipated family movie of 2018. Even though the movie doesn't come out until June, fans are starting to get really excited for the sequel. It was confirmed that it takes place right after the events of the first movie, and it sees baby Jack Jack utilizing his powers for the first time. One of the longest-lasting of New Year's Eve traditions is the New Year's Eve toast, which is usually made with a clinking of champagne flutes, beer mugs, or whatever you can drink out of. But Disney has done something different with the tradition and they have taken it to a new level. 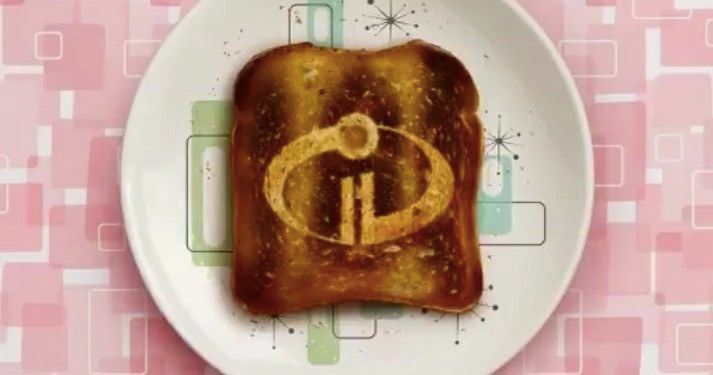 The new toast is a literal piece of toast, burned with the Incredibles 2 logo, offering a "Toast to the New Year," while simultaneously promoting the June release of the sequel. The new "toast" is perfectly in line with the humor of the first movie, which is expected to make it to the sequel as well. Incredibles 2 is the sequel to Brad Bird's 2004 incredibly successful animated hit and will see not just Bird return as writer and director, but nearly all of the original movie's voice talent is coming back as well. Veterans Craig T. Nelson, Holly Hunter, Samuel L. Jackson, and Sarah Vowell will be joined by Bob Odenkirk and Catherine Keener for the sequel. Talks of a sequel have been rumbled about for years, but we're finally going to see it, 14 years after the first installment hit theaters. However as opposed to taking place 14 years later, as previously noted, the sequel will pick up right where the last movie ended. After the success of the first Incredibles movie, Brad Bird went on to make Ratatouille with Pixar in 2007, which also became a big hit. When asked about the possibility of a sequel to the Incredibles, Bird said that it was unlikely unless he was able to come up with an idea that was as good or better than the first movie. It was announced in March of 2014 at a Disney Shareholder's meeting that the sequel had a green light and pre-production began shortly after the announcement. For those hoping to see the Parr family address the recent rise of the superhero genre, you won't find it in Incredibles 2, according to Bird, who says that the superhero aspect of the movie is the least important part of the movie. The Incredibles 2 was originally slated to come out in 2019, but it was pushed up to June 15th, 2018 because the production of Toy Story 4 was lagging behind the production of the sequel to the Incredibles. The bump up is definitely good news for fans and the wait to see baby Jack Jack utilize his powers on the big screen is almost over. While we wait for the movie to hit theaters, you can check out the New Year's Toast below, courtesy of Walt Disney Studios' Twitter account.